Each November since 2005, steeluniversity has organised steelChallenge using one or more of the processing simulations available on the website. Participants in steelChallenge compete to produce a new grade of steel specially designed for the event. Each team may make an unlimited number of attempts to achieve the given specification at lowest total cost. steelChallenge runs for a 24-hour period and attracts people from all over the world. Winners in the industry and student categories of this regional championship are invited to attend the world championships hosted by World Steel Association in Brussels, Belgium. 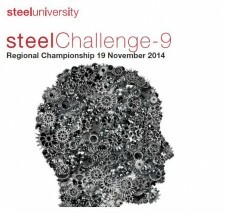 The 9th edition of the competition, steelChallenge-9, starts with the regional championship round on 19 November. Learn the rules, discover the prizes and have a look at the clip about steelChallenge-9.